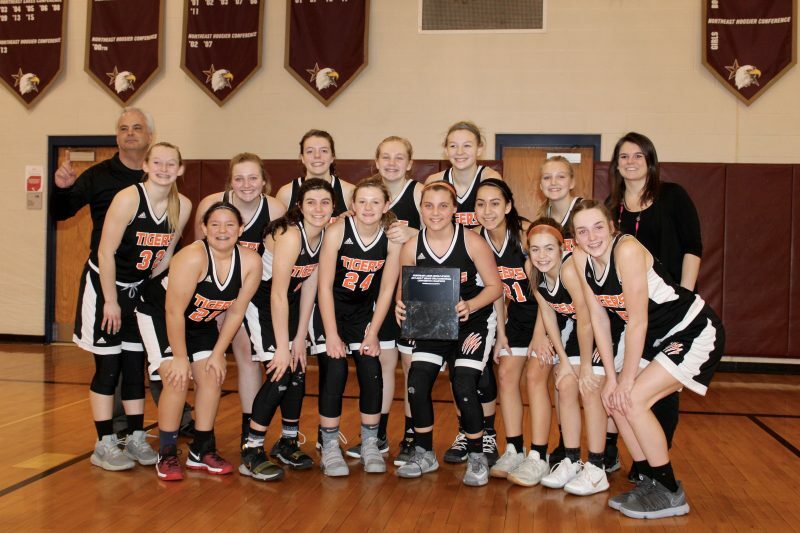 WARSAW – The Edgewood Middle School 8th grade girls basketball team capped an outstanding season with a championship. The Edgewood ladies claimed the NELMSC Tournament title to close out a perfect 16-0 season. The team defeated Wawasee 34-24 and Plymouth Lincoln 40-21 in tourney action at Indian Springs Middle School in Columbia City to finish out the season. The Edgewood team posted a 34-0 mark the past two seasons and won a pair of NELMSC championships. The undefeated team consisted on Jaslyn Brock, Kate Deloe, Phil Evett, Marin Hart, Hannah Hatfield, Kacilyn Krebs and Morgan Nichols. Also on the squad were Abby Sanner, Mackenzie Solcol, Bailie Stephens, Abby Taylor, Adin Um and Eryn Watmough. Lindsay Christman was the coach of the Edgewood team with Larry Speicher serving as the assistant coach.